HERSHEY, PA – The Elegance at Hershey is made up of several events including The Grand Ascent (a vintage race car hill climb), a 5K Challenge run and the Concorso Bizarro (the NEW weird, wacky and just plain tacky car show), but the one that draws the attention of antique car lovers, experts and admirers is the Concours d’Elegance & Garden Party during which over 75 of the most pristine, stylish and stunning collector cars you will ever see will be displayed throughout thegorgeous gardens of The Hotel Hershey®. 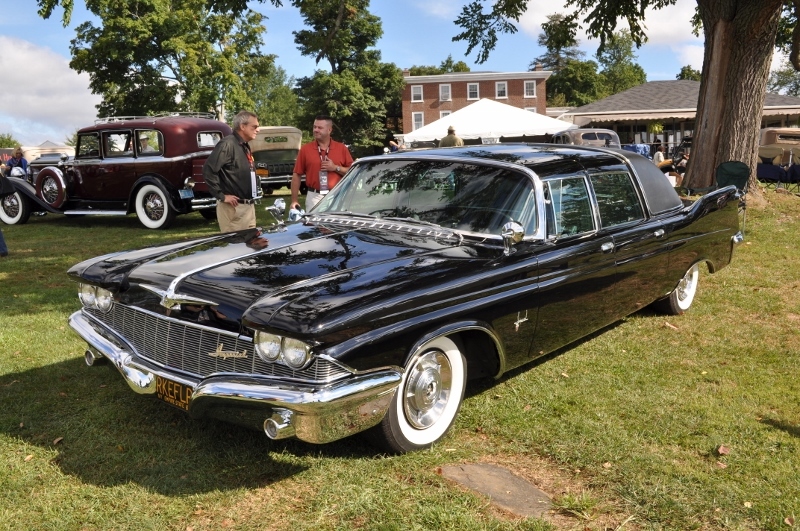 Chrysler found the cost of tooling for a limo of its own was cost-prohibitive so the company partnered with Ghia in Italy. Virgil Exner and his personal staff, Cliff Voss and Bill Brownlie, designed the stunning Crown limousine. Imperial convertible chassis arrived at Ghia where a 20-inch stretch was made, along with hand-made body panels. Cars spent a month being produced at Ghia with two weeks on painting and hand-rubbing the finish to perfection. A total of 17 were built in 1960. New York Governor Nelson Rockefeller special-ordered this car, one of two with parade lights mounted behind the grille (the other owned by First Lady Jacqueline Kennedy). It is the only four-window extended canopy vinyl roof example built between1957-1963. It was used by Rockefeller in New York while he was governor, and later became part of the Paul Stern collection. Power is supplied by a 413cid/350hp “Wedge” V-8 and 3-speed Torqueflite automatic transmission. Other than some repainting, it is largely original. The Derham Body Co. of Rosemont, Pennsylvania, was the longest surviving coachbuilder in America, producing bodies from 1887 to 1974. Derham had a reputation for building fine enclosed horse-drawn carriages and coaches, and quite naturally turned to automobile bodies after the turn of the century. Derham was renowned for building one of the most beautiful of all open Duesenbergs, the Tourster. Chassis J-448 is one of eight Toursters produced by the firm – it being most notable for its vertical hood side louvers. With a design attributed to Gordon Buehrig, it became Derham’s trademark model and Buehrig’s personal favorite. This distinctive version of a traditional phaeton had its rear windshield incorporated into the front seat back. Customers of the Derham Tourster included film star Gary Cooper and comedian Joe E. Brown. In total, Derham bodied 16 chassis for Duesenberg. Lamborghini’s Miura brought mid-engine power to the forefront of exotic car design and engineering. Powered by a 4.0-liter transversely mounted quad cam V-12 mounted amidships, the car was first shown as a bare chassis at the Turin Motor Show in November 1965. It reappeared in Geneva in March 1966 cloaked in sensational Bertone coachwork styled by Marcello Gandini. The car created such frenzy, Lamborghini was overwhelmed by an onslaught of buyers asking them to produce the car. A total of 760 were built from 1966-1973, offering staggering performance for the time: 0-60 mph in 6 seconds with a top speed more than 170mph. 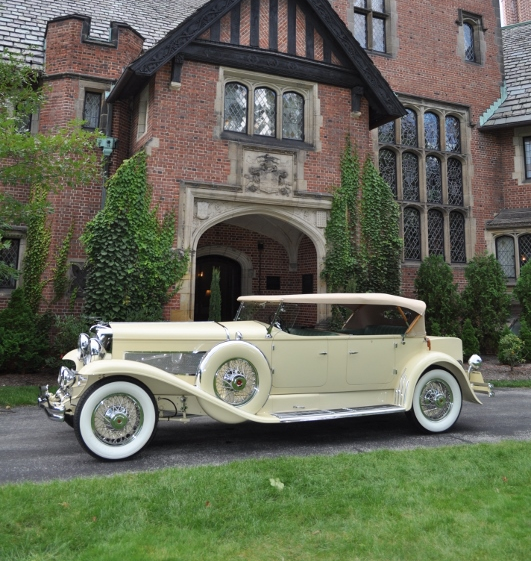 The car to be displayed at this year’s Elegance at Hershey is owned by Leslie and Leigh Keno. 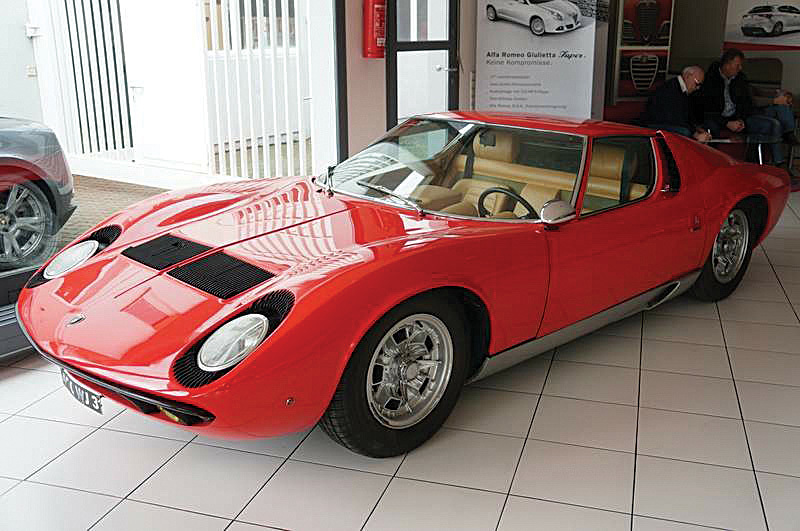 The Keno’s Miura remains in original, unrestored condition and is one of approximately 140 “S” specification cars built. Its interior is upholstered in beige Cinghiale wild boar hides, one of two produced with that type of leather. The only other upholstered in such a manner was owned by Frank Sinatra, Jr. This year’s Elegance at Hershey takes place at The Hotel Hershey ® in Hershey, PA, from June 12-14. For more information and to purchase your tickets online, visit www.theeleganceathershey.com.